Do you already have A Dozen Roses? Jennifer Rounds, co-author of A Dozen Roses (our featured book last month), was delighted to read the wonderful comments about the book. She sent me a premium to offer to one of my readers who already has the book (or who has definite plans to acquire it). 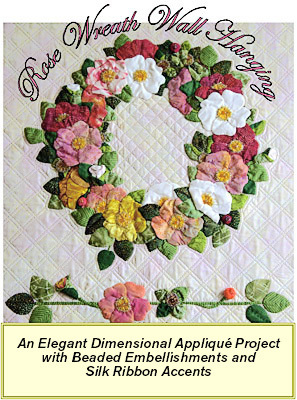 Her pattern “Rose Wreath” is a spinoff of the coverlet project from A Dozen Roses that we were all slavering over. The instructions in the book are the foundation for the pattern’s how-to’s so Jennifer says that it’s better to be familiar with the process in order to complete the project. 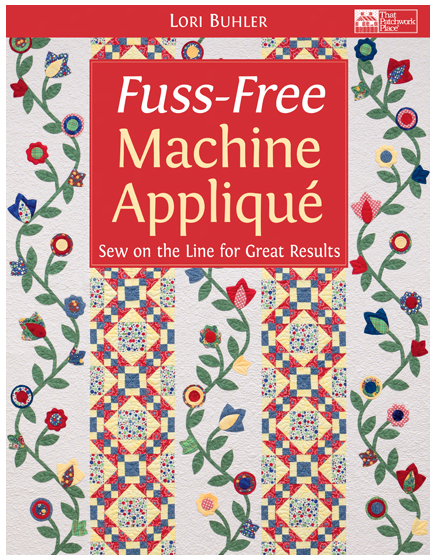 If you are already the proud owner of the book (and yes, Barbara you’re eligible :) ), leave a comment by 7:00 p.m. California time on Thursday, August 5, for a chance to win this beautiful pattern. 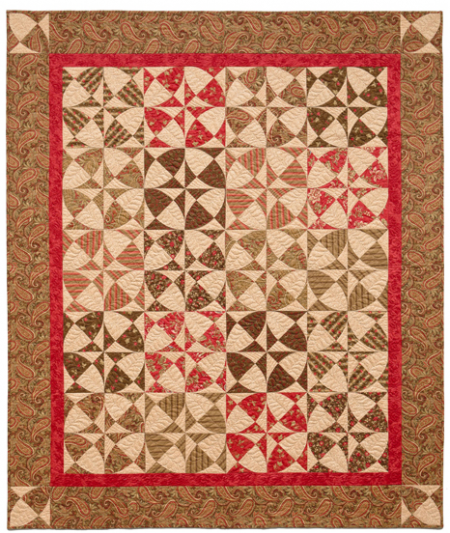 The pattern is available at Rosie Quilters. 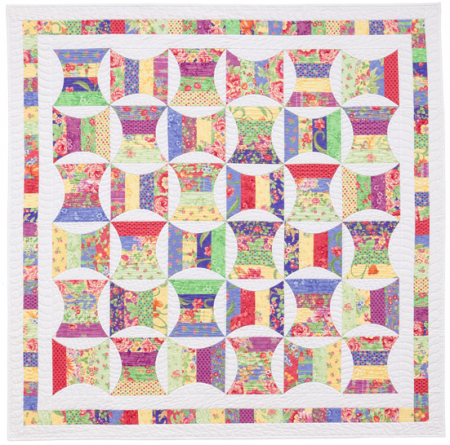 Next time, a look at More Fabulous Flowers: Mini-Quilts in Dimensional Appliqué by Sharon Baker. 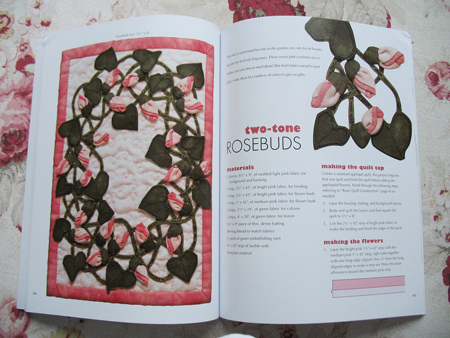 The height of summer seems like a great time to enjoy a book about rose quilts. 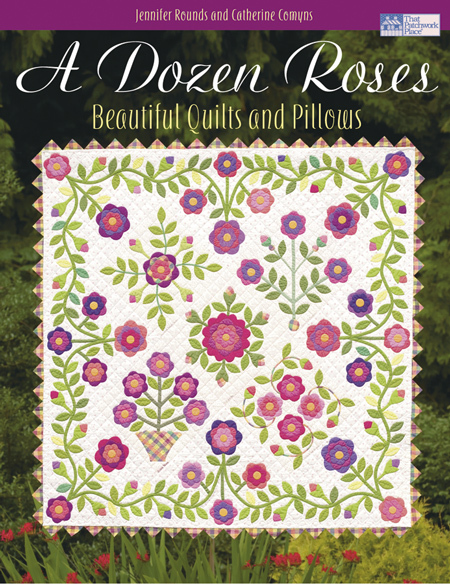 A Dozen Roses by Jennifer Rounds and Catherine Comys offers a beautiful blooming set of twelve projects including bed quilts, wall quilts, pillows, and shams, using appliqué, piecing, knitting, and even velveteen! So many ways to bring a bouquet into your creative life. 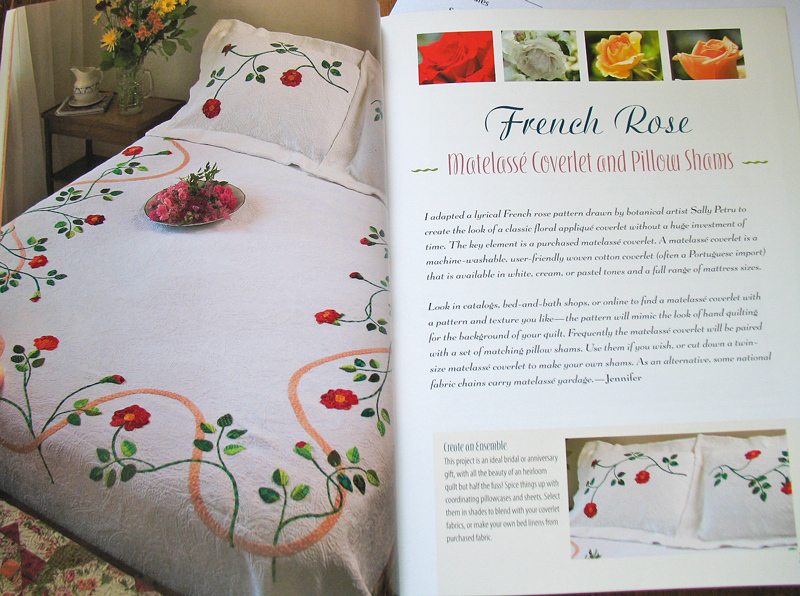 I was particularly intrigued to read about how Jennifer embellished a purchased cotton matelassé coverlet with beautiful sprays of red roses. The method she used is prepared-edge faced appliqué, which she steps you through in detail, and which gives a bit of dimension to the appliqué pieces. Both the coverlet and the method were new ideas to me so of course I filed them away in my appliqué bag of tricks forthwith! 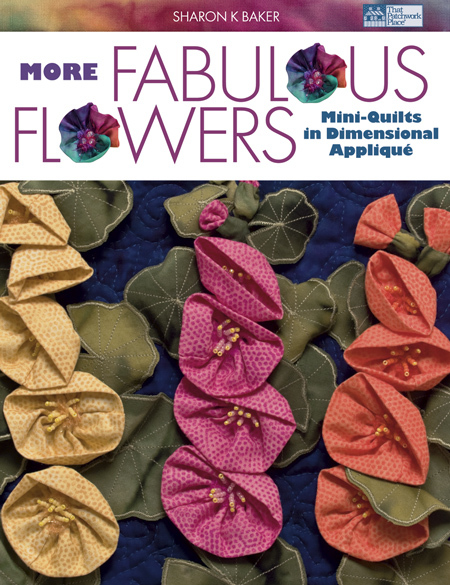 Besides faced appliqué, there’s information on split leaves and inset leaves, folded bias strips, and folded-petal roses. 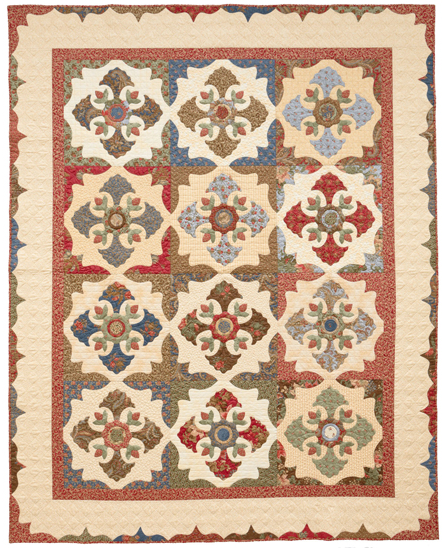 Martingale & Company / That Patchwork Place has provided a copy to give away, so if you’d like to bring a little rose culture into your quilting, leave a comment by 7:00 p.m. California time on Sunday, July 11. U.S. and Canada only, please (unless you’ll pay the shipping). If you’re subscribed by email, click over to the blog itself and scroll to the bottom of the post to leave a comment and enter the drawing.